One example or the CB, the letters believed to mean Curtiss Battleplane, was built at Buffalo early in 1918. This was a two-seat fighter type intended to be Curtiss's successor to the troublesome Liberty-engined Bristol Fighter. The fuselage was an early example of Curtiss ply construction, where two layers of two-inch wide wood veneer strips were cross-laminated over a form to build up a monocoque fuselage shell. 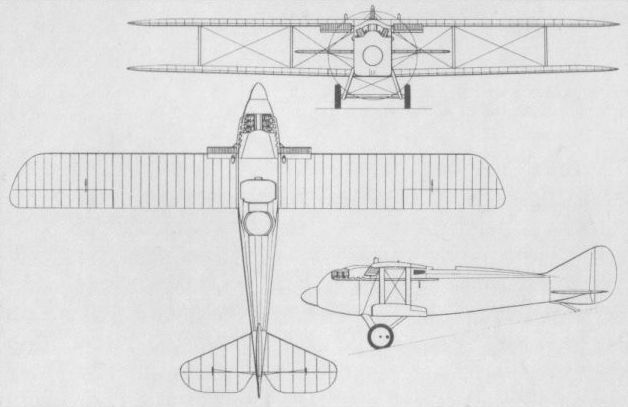 Unusual features of the CB by contemporary practice were the installation of the radiators under the leading edges of the upper wing near the fuselage, where they had a very detrimental effect on airflow over the wing and into the tail, and the lowering of the upper wing to the top of the fuselage. While this provided the rear gunner with a fine field of fire and the pilot with good upward visibility, the pilot's view forward and down was impaired, although small windows in the side of the fuselage gave some help. The main disadvantage of the lowered wing was the aerodynamic penalty of the very narrow wing gap that resulted. The CB crashed early in the test programme and no further development was undertaken. The CB (Curtiss Battleplane), unofficially known as the "Liberty Battler", was an experimental two-seat fighter developed and flown early in 1918 as a result of difficulties being experienced with the Liberty-engined version of the Bristol F2B. Powered by a 425 hp 12-cylinder Liberty 12 water-cooled engine, the CB two-bay biplane was an early example of "Curtiss ply" construction - two layers of 2-in (5,08-cm) wide wood veneer being cross-laminated over a form to build up a monocoque fuselage shell. In an effort to maintain fuselage streamlining, the radiators were slung under the upper wing centre section, where they were found to have a seriously detrimental effect on the airflow. The fairing of the upper wing into the top fuselage contour resulted in a very narrow wing gap, with consequent aerodynamic penalties. While it provided the rear gunner with an excellent field of fire, it impaired the forward and downward view of the pilot, necessitating the provision of small windows in the fuselage sides. Flown in May 1918, the sole prototype CB proved to have extremely poor handling characteristics and crashed early in its test programme. Empty weight, 3,575 lb (1622 kg). Span, 39 ft 4 in (11,98 m). Length, 27 ft 1 in (8,25 m). The CB Battleplane was Curtiss's attempt to replace the unsatisfactory Bristol with another Liberty-engined two-seat fighter. The sole Curtiss Battleplane (CB) of 1918, also known as the "Liberty Battler”.